Inter Milan sealed a fourth consecutive win in as many games to sit top of Serie A with a 2-0 victory at Crotone on Saturday as AS Roma eased past Verona 3-0. 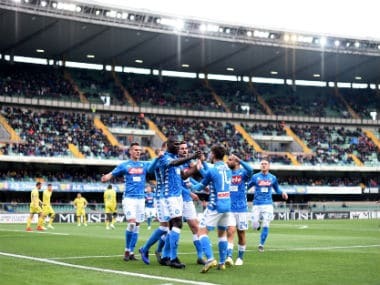 The win in Calabria allowed Luciano Spalletti's Inter to position themselves among the title challengers alongside champions Juventus and Napoli, who will also bid to make it four out of four on Sunday. 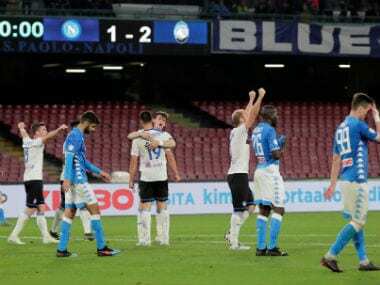 But Spalletti's side suffered in the heat of a region in the toe of southern Italy until late strikes from Milan Skriniar and Ivan Perisic put them top. "It wasn't easy," said Spalletti. "Winning in these circumstances shows we can adapt. "It was very hot in Calabria, the pitch was very dry and slowed down the pace of the ball, while the wind also created problems in the first half." But former Roma boss Spalletti refused to get carried away despite his side's unblemished record this season. "We are not interested in the table right now, we just did what we had to do. It's a long road ahead of us and we won't get swept up in the moment." Crotone shocked Inter 2-1 at the Stadio Ezio Scida last April in a defeat that ended the Milan club's bid for European football this season. But despite the pressure the Serie A strugglers held on for 80 minutes largely thanks to the efforts of goalkeeper Samir Handanovic who saved from Aleksandar Tonev and Marcus Rohden just after the break. 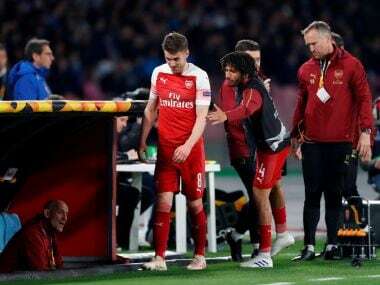 The final ten minutes proved fatal with first defender Skriniar scoring on 82 minutes after a free kick which the Crotone defence failed to clear, and then in-form Croatian striker Perisic three minutes into time added on. "I'm happy with this first goal in Italy, although for me it is more important to have won," said Slovak international Skriniar, a summer signing from Sampdoria. "We didn't have a great game, but winning was really important. Here it's not easy to play, the fans are very fiery, but we managed to bring the game home." Crotone narrowly avoided the drop last season and this term are also in the bottom three after just one point from four games. AS Roma's win at the Stadio Olympio allowed the side from the capital — who have a game in hand — to move into the top half of the table and ease the pressure on coach Eusebio Di Francesco after a goalless draw in the Champions League to Atletico Madrid. Edin Dzeko, who made headlines for criticising Di Francesco's tactics in the Atletico stalemate, hit back with a brace on 34 and 61 minutes with Alessandro Florenzi marking his comeback after nearly a year out injured with an assist. Radja Nainggolan had gotten the Romans off the mark after 22 minutes under driving rain, with Patrik Schick making his debut and almost scoring. "We could have scored more goals, at least I could have," said Bosnian striker Dzeko as Roma take their points tally to six after three games and sit seventh. "These games are to be won, they end up being decisive," said Di Francesco. Samuel Souprayen saw red for Verona, who suffered their third loss in their return to the top flight, and are second from bottom. Earlier, Fiorentina followed on from last week's 5-0 rout of Verona with a 2-1 win at home against Bologna in a game dubbed the "Apennines Derby" because of the mountain range separating the two cities. Bologna stifled the hosts' attack in the first half before Federico Chiesa broke through on 51 minutes with a curling shot into goal only for Rodrigo Palacio to equalise a minute later. German Pezzella headed in the winner off a Cristiano Biraghi corner after 69 minutes as the Tuscany side moved up to sixth. Bologna stay tenth after their second defeat. 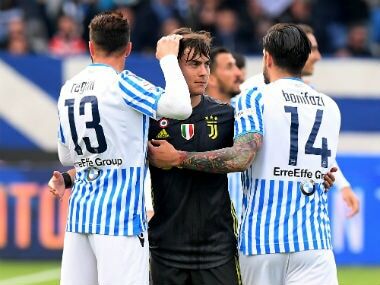 On Sunday, Juventus travel to Sassuolo and Napoli host promoted Benevento, both looking to join Inter on 12 points.